The cover is just amazing--I loved the first one as well, which I will have to grab from the library when I return from my trip. Looking forward to it! Longer is better, in my opinion, especially if you love the story and the characters - which I do!! Yay! I can't wait!! ohhhh! Exciting! I'm sooo itching for this book to come out! :0) The cover is FANTASTIC! Oh, WOW. That looks gorgeous. Can't wait to get my hands on a copy!! It really looks brilliant. David Ho is the artist for the trilogy and yes, isn't he amazing. Also very nice! The interior art is by Sheila Rayyan, a lovely person whose husband did the illustrations for The Unicorn's Secret. I was already looking forward to Sacred scars, and the preview got me even more keen to read it. Any idea of the Australian release date? 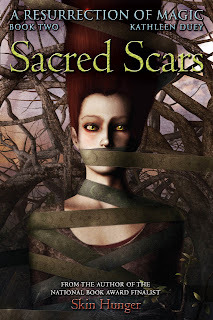 Kathleen, What a great idea to include a section of Sacred Scars on ipulpfiction! A perfect way to advertise the book! Brilliant! Release in Australia is August fourth. I hope you like it. Oooooh! I CANNOT WAIT to read Sacred Scars!!! I hope you like it...the third one is just emerging out of the mist for me now. I have hundreds of voice-notes, a stack of written jumbles and piles and files on the research topics. A lot of sociology goes into these. In about a week I will disappear (except for SCBWI LA) until Fall. Best to you, and I am so glad I'll get to dance with you at the August conference! Yes. See you Saturday night at SCBWI. The annual chance to dance and you know I will, until the music stops! Am working on my speech. I want it to rock. Very excited about this preview. Thanks for posting the link. Yes. I am. In hiding...writing madly on the third one...shhhhh...and thanks for checking in. Thanks so much for the kind words, I hope you like Sacred Scars...it went places I never expected it to go. Ummm... Could you possibly tell me when Sacred Scars will be released in Australia, if it hasn't been already? I absolutely adored Skin Hunger and have been hanging out for the sequel. I asked my editor to find out and she...apprently didn't. THANKS Jonathan, for setting it right!! When is this third book coming out???? I'm so keen to read it? Thanks for liking my books! The third book is in production now. I will have revisions to do, copy edits to respond to, the cover will be drawn, the book designed....etc...I hope it can be early 2014, but can't be sure. I am making a list of people who want to be notified when I know the release date.